This set is a great way to experiment with the most popular Primo! 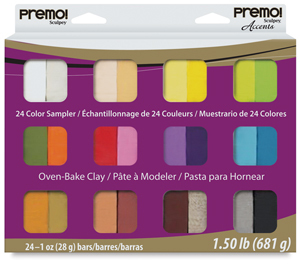 Sculpey colors. It contains 24, 1 oz blocks of clay, including one each of Antique Gold, Black, Bright Green Pearl, Bronze, Burnt Umber, Cadmium Yellow, Copper, Ecru, Gold, Gray Granite, Magenta Pearl, Orange, Peacock Pearl, Pearl, Pomegranate, Purple, Purple Pearl, Spanish Olive, Sunshine, Silver, Translucent, Turquoise, Wasabi, and White.